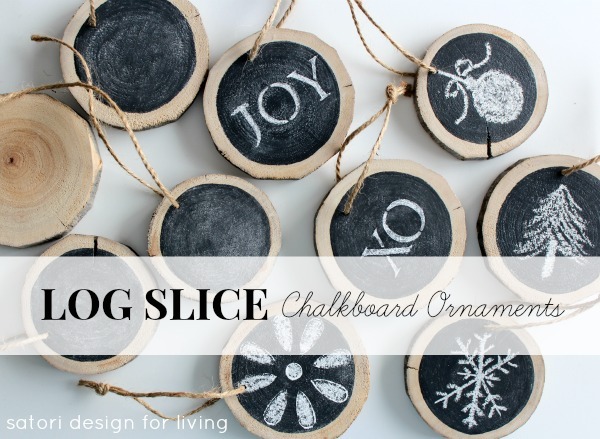 Log slice chalkboard ornaments are so versatile and simple to make. Perfect as Christmas tree decorations, gift embellishments, place card holders and more! I was very impressed with the glass paint projects the gals came up with last week. You? 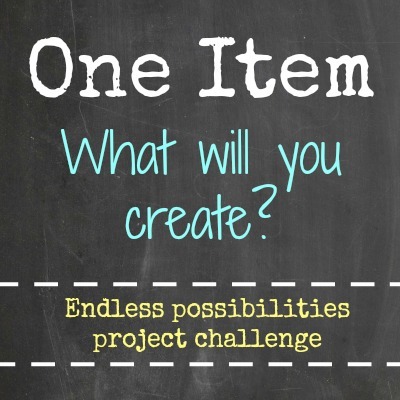 I’m certain this round of the One Item Project Challenge will be no different. If you missed the introduction to this series and want to be brought up to speed, be sure to check out my snowflake glass canisters where you will also find the links to Kristin, Tiffany and Tara’s projects. This week, I chose branches (twigs, logs or basically any part of the tree) as the item we had to work with. I’ve always been drawn to natural materials and knew I wanted to add a touch of the outdoors to my holiday decorating scheme this year. 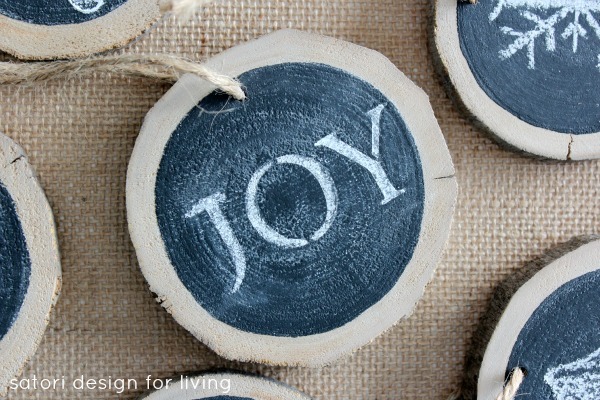 That’s when the idea for log slice chalkboard ornaments came in. Those of you who have been following my Holiday Countdown know that I suggested gathering outdoor decorating materials several weeks ago before the weather turned miserable. Being a procrastinator at times, I waited until Friday to find the large tree branch I knew I would need for this project. The morning started out as rain and turned to sleet, and the forecast was saying snow for Saturday. I threw on my parka and the first boots I found and trudged down to the river. Unfortunately, I didn’t realize the paths were like a skating rink, and I ended up falling really hard on my back and elbows. Lesson learned- DO NOT wear fashion boots into the woods, practice what I preach about gathering stuff before the weather turns and, lastly, choose less life-threatening DIY projects! Needless to say, I survived. Despite having a sore back and a bruised ego (forgot to mention there were witnesses to my Home Alone type fall), I did manage (with a lot of help from my husband) to make the log slice chalkboard ornaments I had envisioned. Some affiliate links are included for items I used for this project, which allows me to make a small commission from your purchase without an extra cost to you. Thanks for supporting this blog! 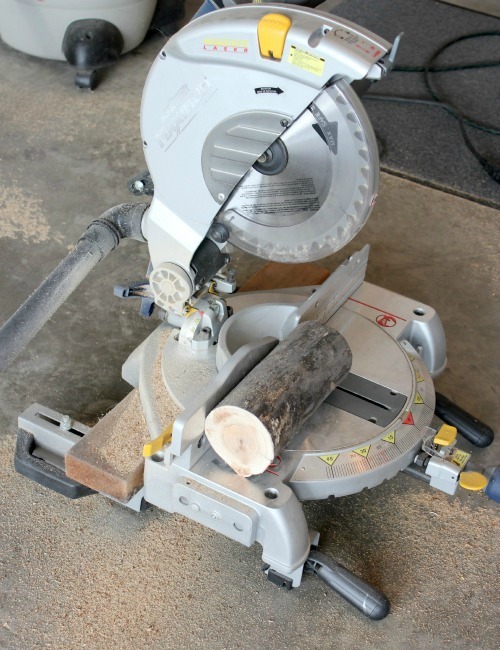 To begin with, cut your log into slices (a little less than ½” thick) with a mitre saw. To get a nice clean cut, you may need to place a board under the log (we found doing that kept the bark in tact all around the log, especially on wider logs). Once you have as many slices as you want, drill small holes in each about ¼” from the top to put the jute string hanger through. Sand each one lightly to remove loose bits. 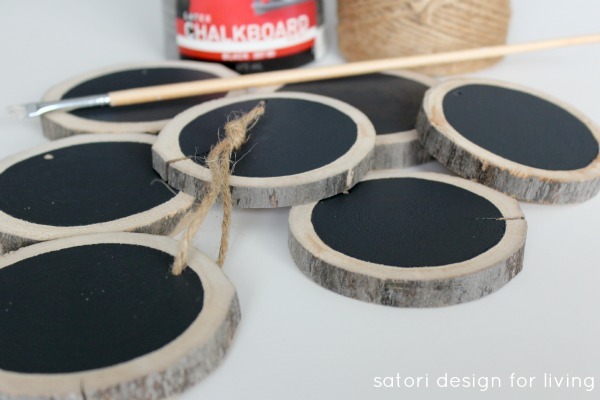 Make sure the surface is fairly smooth and apply two coats of chalkboard paint leaving a small border of wood showing. Let dry and feed the jute string through each hole knotting together at the top. Prime each chalkboard by rubbing the surface with a piece of chalk on its side and then wiping with a dry rag. I learned this trick from my friend Heather to prevent the first drawing from being permanently etched on the surface. Now you have a chalkboard surface to write or draw anything on. I freehanded a few designs and used stencils to create others. The sky’s the limit! Other than hanging them on the tree, I think they’d make lovely place card holders too. Am I right? 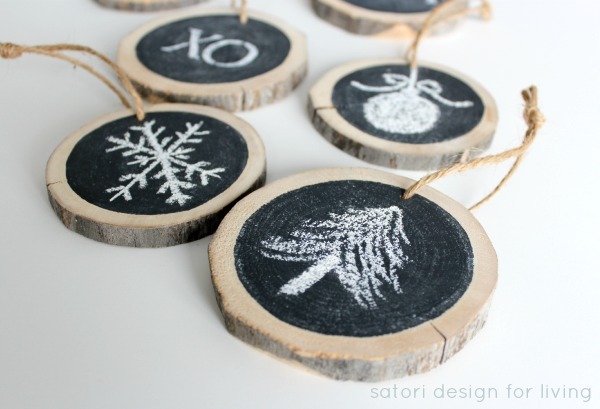 So tell me, what would you draw on these wood slice ornaments? Be sure to come back next Wednesday to find out what the final craft supply was on our One Item Project Challenge list and see what we all did with it. Update: See our projects here. 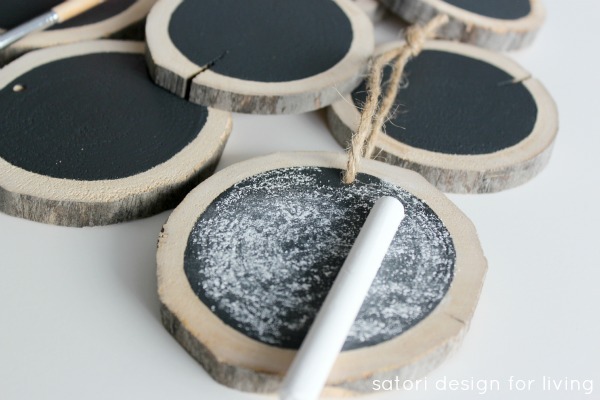 You can find more ideas like this in the Winter & Christmas Project Gallery, including how I used these chalkboard ornaments as gift embellishments! 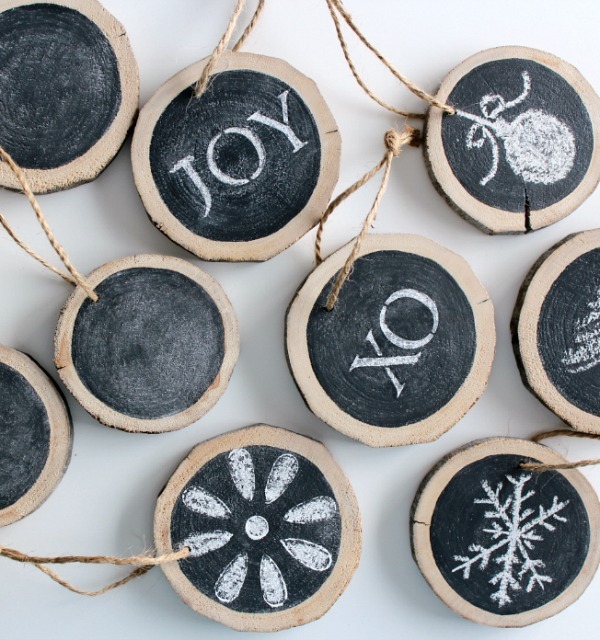 Have any DIY Christmas ornaments of your own planned? I’d love to know what you’re up to! Oh Shauna! First of all I love those ornaments, they turned out perfect! Too bad about you wiping out along the path – at least you looked great, hey? (I’m sorry, I’m laughing…). Thanks for the little shout out too, take care my bloggy friend – and find some safer DIY projects, would ya! It was like something out of Home Alone. I guess that’s what I get for being so careless! Thanks for the heads up on priming the chalkboard. I had made one a couple years ago and didn’t do that- you’re right, it does etch! Great idea~thanks Shauna! I am impressed: a saw and a drill!! I am a little scared of both. Have a great day. I am LOVING this idea. It’s so pretty and simple and lovely. I wanna make some! Those are just charming! I will have to get working on a bunch for our tree this year! How did you get your edge so amazing and straight? I \LOVE this project! 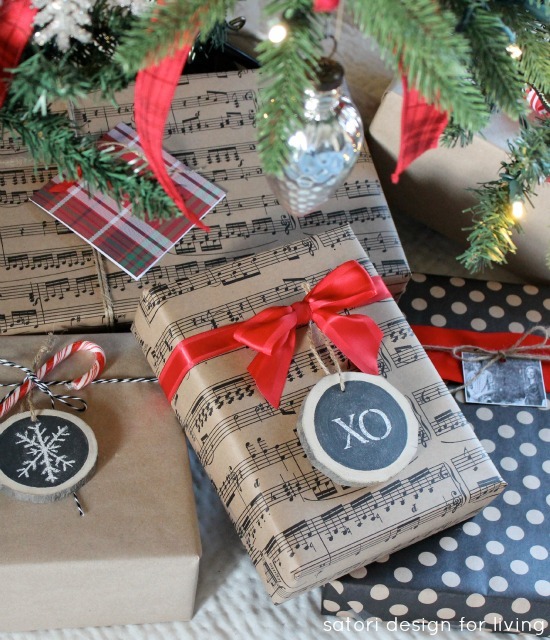 They would make amazing gift tags! I’ve pinned it all over the place! It’s called having help from my husband- he has way more experience with power tools than I do. Major brownie points! Oh no, I mean the painted line, your chalk painted circles are just perfect! Did you tape them off, or is that free hand? Oh duh, I see what you mean! I freehanded them with a smaller paint brush. I guess I’m wasting my steady hand on crafts when I should’ve been a surgeon LOL! THese are adorable!!! So cute and original, sharing, pinning. Glad your site is back up. These are awesome Shauna! In fact all the projects are fabulous – you are one talented group of ladies! I will have to try the slices one day, and thanks for the reminder about priming with chalk. Love all the projects too! It was anywhere from 3 to 5″ in diameter and had to be about 12 feet long. My husband said I looked like a Labrador Retriever who was excited to find a new stick in the woods when I came home. It was a bit of a hunt, but lugging it up the path from the bottom of the bank was the real challenge (after having fallen before and being icy). The things we do for DIY! 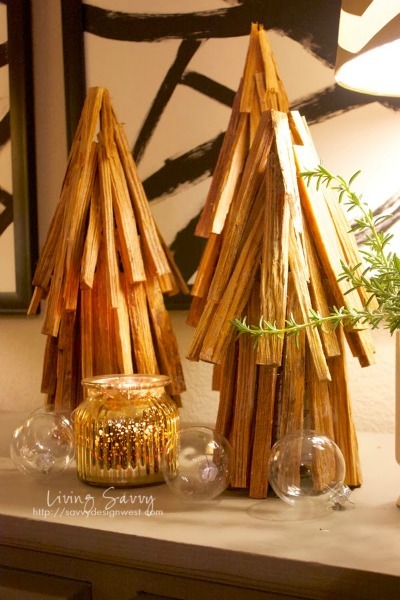 So cool, if I have spare time I’m definitely trying the log ornaments. These are so pretty! I got a miter saw for Christmas last year that I’ve hardly used. This looks like a good project that I can use it for. Thanks! These are so pretty! What a great idea! I love the rustic look of the ornaments, you did a great job with them!! Beautiful! What a cute idea, Shauna! I’d love them on packages, too! These are beautiful! Love how classic and modern they are! 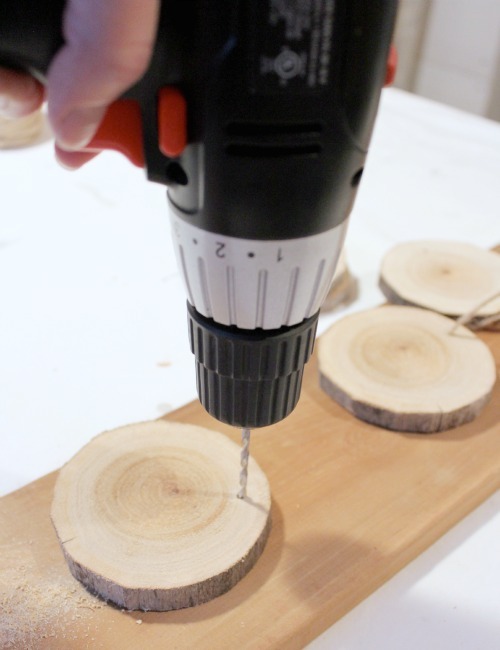 What a cool idea for log slices! 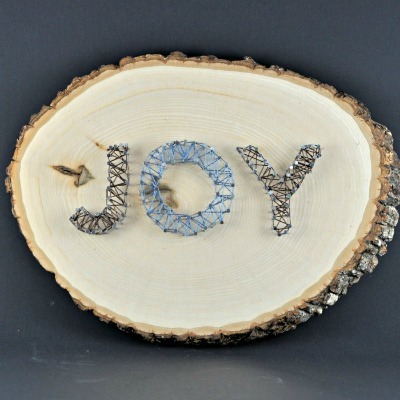 I love nature inspired crafts, thanks for sharing. You should link up at my Link It or Lump It link party going on right now! 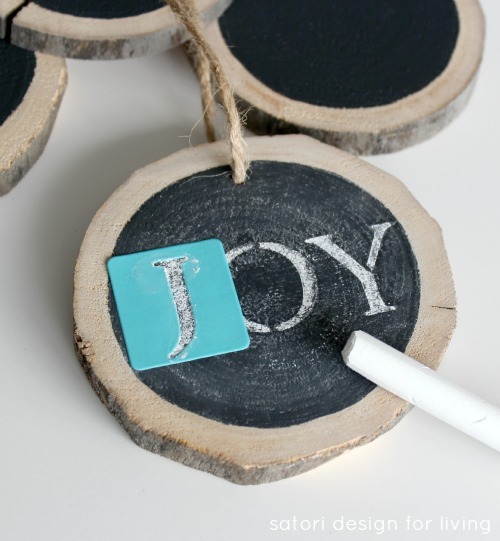 I love the rustic chic style of these pretty ornaments! Great job! I simply LOVE these. What a great decoration idea!!!! These turned out so cute, lovin the rustic look this year. New Follower! I would love it if you would link these up at my Holiday Party! 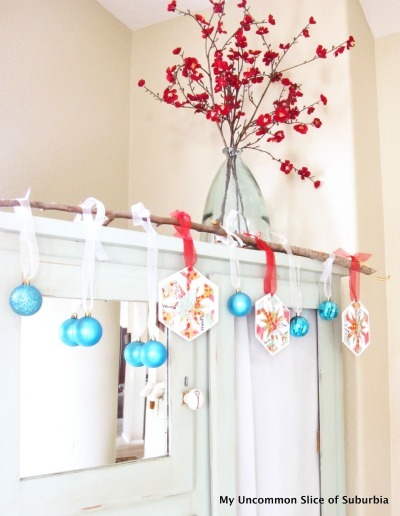 What a great idea for ornaments! 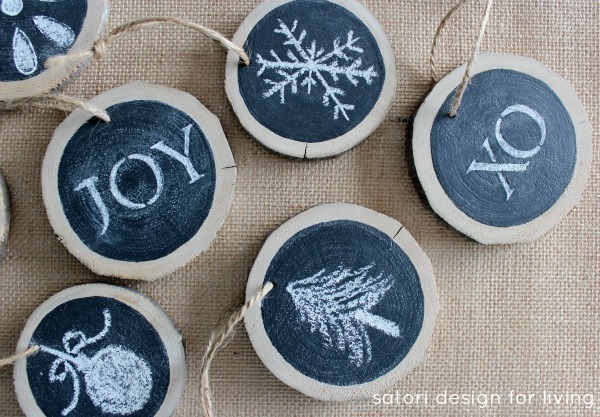 I’ve seen the log/chalkboard for other uses, but not yet for ornaments and I like thm a lot! These look amazing and I know what I’m going to be doing this weekend! Thanks for sharing! I love these and am hoping to make some this year for gifts! One question – do I need to spray or paint with some type of perservative? Hi Laura, I didn’t find it was necessary. We’ve used them for a few years now and I find they still look the same. Pretty resilient! Where did you find your stencils? Hi Angie, I picked them up at Michaels. They’re Martha Stewart brand.